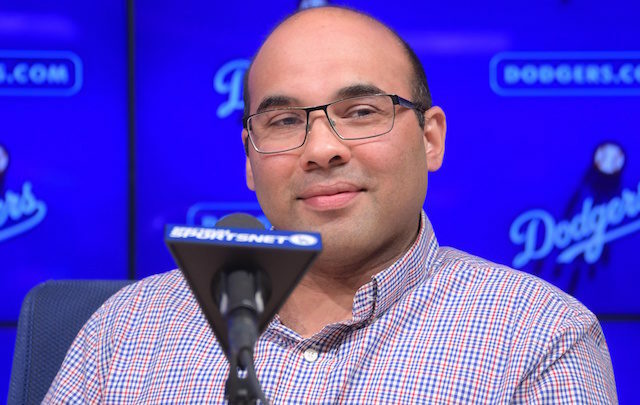 The Giants announced Tuesday they have hired former Dodgers general manager Farhan Zaidi as the team’s new president of baseball operations. Zaidi was named the Dodgers’ general manager in 2014. Los Angeles made back-to-back World Series in 2017 and 2018. The team had not been to the Fall Classic since 1988. San Francisco head of baseball operations Brian Sabean took a step back after the season. The Giants also fired general manager Bobby Evans in September after the team went a disappointing 73-89 following an offseason where it traded for All-Stars Evan Longoria and Andrew McCutchen. Sabean remains with the team but his role is yet to be determined. Zaidi, 41, will report directly to Giants CEO Larry Baer and is expected to be given the authority to build out the rest of the front office, which will allow him to hire the franchise’s next general manager. A graduate of the Massachusetts Institute of Technology with a doctorate from UC Berkeley, Zaidi’s first job in baseball came more than a decade ago as a data analyst with the A’s. Despite a heavy analytical background, Zaidi has been lauded his peers for promoting the value of traditional scouting methods in each of his previous jobs.